I played this game one year ago, maybe 2 (It was named warlight, I got redirected from "warlight.net" to "warzone.com" so I think its the same), but I cant remember my profile email, or my username! However, I really liked it, and came back now. I am doing my best by looking at tips and tricks between each game, ps has some great guides. But when do I get to play other games than Small Earth and Strategic 1v1? I liked more the old version where you could play many games and not just one at the time. Also: I am very interested in learning. I met a really helpful player last time. Dont remember his name. I think it was some numbers in it like 1234. BUT I would really appreciate someone teaching me more. I remember basics like moving around a lot before attacking, and dont pick all in one spot, but I think it is more to this game than that and I want to learn. If you can help, please send a message? I probably sound really silly, but I dont want to lose games so I need help. I liked more the old version where you could play many games and not just one at the time. You still can. Quick-match is not your only option :) There are still open games. If you want several tabs open at one time, then flash is the best option. 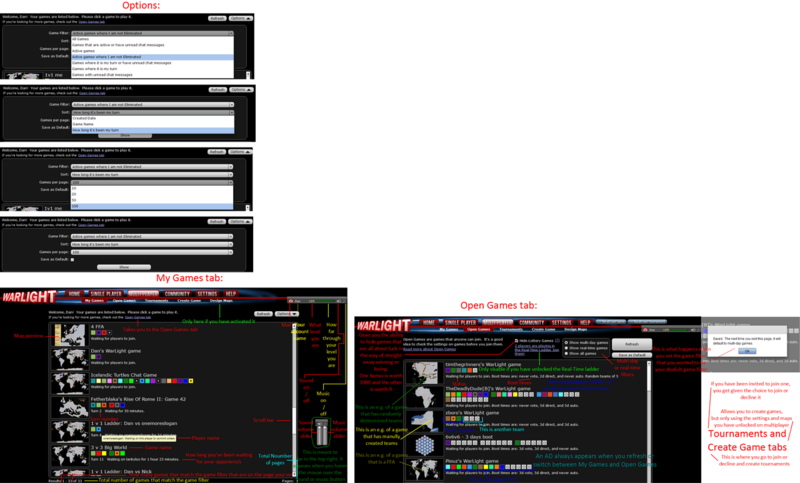 Else you can use multiple unity windows or just go back out and in from each game while it is still being played. When I switch to Flash, I cant open game: It says "Connection Error" or similar. But my network is great! Also this player got mad at me: Lucien Müller. He said he will blacklist. Does that mean I will get reported? I never was active in community before, so dont know all terms. He called me an Alt, and mention some names, what does this mean? Also why report me? I dont even think game was over when he surrendered! I will read guide, thank you very much! Blacklisting does not get you reported. It just means that player will kind of stop playing in games with you (you might still end up in the same game since blacklisting isn't all that comprehensive). Unless you're abusing them in specific ways to manipulate the results of a game, tournament, or ladder, alternate accounts are also not against the rules. So even if you are an alt trolling us on the forum for some sad reason (I won't judge, I've been there too), from what I know you don't need to worry about having any actions taken against you. If anyone's going to get in trouble for that game, it's going to be Lucien for the language he used. But that's unlikely too. When I switch to Flash, I cant open game: It says "Connection Error"
Sorry, couldn't help myself, the bad grammar makes it pretty comical desu. Report him for being a dickhole, that'll get him suspended guaranteed. Have you picked more territories than what you will end up with? How many territories will you receive? How many armies will there be on each territory? How many neutral armies will there be on each neutral territory that wasn't in the selected distribution mode? How many neutral armies will there be on each neutral territory that was in the selected distribution mode? Are there wastelands (the 10s)? Can you take advantage of the wastelands? Is there a good amount of space to spread? Are there any wastelands near that will effect you spreading? Can you compleate the bonus(es) at a fast rate? What are the kill rates and how much armies do you need to take over 2, 4 and 10 defending armies? How many armies will you need to take over all the neutrals? How many of these armies will be lost? How many turns will it take for you to regain the armies that you lost ? Am I still only attacking neutral? Have I deployed the amount of armies that I need to take over the entire bonus? Have I deployed the armies on the correct territory? Am I bordering a player? Will I need to change my spreading rate because of this? Will I need to defend the territories that I border with another player? I will report, not nice to say things like that. So blacklist is not report? If you still meet what good is it? Also he could see my texts because he responded so how did he do that? You said he did to not see. What you mean norwegian-germanic war? My english is not bad like that? I've only blacklisted one player, and that's because he did a similar thing. He raged, reported and blacklisted me for abusing vacations, even though I'd come across a tricky situation where I was on and off vacation for a bit. Just because I happened to be losing in that one game, he reported me. I admit, it looked a bit suspicious, but I explained it to him and he still was unreasonable. "Also this player got mad at me: Lucien Müller"
That guy is well known for being rude to players! He should honestly just be banned already if he does this so often. Report him. lucian has always been polite in my games with him. i think the fact that random atls pop up in QM and harm someones ratings piss people off, veteran players should not make or use alts and then there is no problem. I believe Fizzer's already handled the issue re:Lucien. Don't think there's any need for further action (or really any sort of action outside the reporting system). Hi! I am not "alt", I said earlier I played long time ago on warlight but not remember my login information sadly for old account. But! I post this to get help on strategy, not to know how I report player. I just want everyone be nice (was bullied earlier so dont like mean comments). So can people please help me understand the game? I learn a lot from 101st now but also appreciate any players inviting to games, so I get better :) If you notice some mistakes in my game I very much would like to know! Also thanks to krunx, cowboy and zero blind dragon for letting me in 101st, you are really nice players. Not like lucien but welcoming and helpful! Also thanks to Xenophon, almosttricky, fivestargeneral, kicorse for inviting to game! It helps very much. Also hanks to Mega Knight and Dan for giving good advice. If I forgot anyone, very sorry! Well this is a nice surprise on a Wednesday evening to see one of your members acts like a complete jackass. If any player of Outlaws acts in this absurd behaviour, please please please let me know and I promise a very swift conclusion that makes everybody happy. I will hope to see Lucien apologising in this thread to the player. No excuses. Regarding to Pavey, https://gyazo.com/e4cb3e7b5cb07a89b371c191e5ca9f58 Why did Pavey put his name as Mikael Pavey when his username was just pavey? Why did he keep the chat alive by saying "hello?" on turn 6.. to a obviously frustrated player (did he want the reaction)? Why is his playing speed so fast.. 0 mins fast? and why does he have a provoking nature to him.. asking a player "can you help me train" when Lucien said "great a lame voting alt" not addressing the accusation as a serious player would. Not that I'm insinuating that Pavey is a "troll alt" but you can understand how a player could conclude such an analysis, which you can say didn't exactly help Lucien calm down either because of his perceived conclusion. This is how Lucien thought the situation as far as what I've seen. Whatever the case, I hope Lucien apologises to the community for his quite rude behaviour, If there's even more rude behaviour just send them in private to me. I'm dealing with this matter as we speak. Than we will all hold hands under the happiness sun and be one happy family again. C'mon Lucien, all you had to type was "I understand." It is a sign of realism if somebody with 100% winrate understands that he is not the best player in the world if he has mainly played QM SE Auto Dist, Lucien. He asked you for training because you are obviously an experienced player with a lot of achievements on your profile. Do you mean to say that this behaviour of his is known to the entire community with the exception of the Outlaws members? I now understand why cloud did this lmao. As far as alts and QM, I agree using alts to upvote templates should be banned if it all possible, but the fact is QM is the only stable place to get games from for any account below level 47. I know it's frustrating to play accounts that are low rated, that have very high skill, but as long as levels are in the game, it's basically the only way possible. Why would one want an alt? Besides the fact I have multiple accounts to form a team on 2v2 or 3v3 ladder, or to test templates. I need alts because I keep running into the problem of reaching max tourneys made. I have 3 accounts and all the tourney slots are full. If this was removed or we got more slots, I would not have a need to create any more alts. You can't solve a crime if nobody reports one. None of my members were aware of Lucien's actions and neither was I, we're in plenty of discord chats and if we didn't know, It would always be a help if somebody report the crime. Especially if it's done in quickmatch, how were we meant to know? It wasn't as if he was going to abuse an Outlaws member. Within a day of a post on the thread, we're on top of it. You can't ask or imply we were naive to Lucien's behaviour. There was background context to that game. Which proved to be true may I add in favour of Lucien. Due to this, I had no problem letting in Lucy into the clan on the condition he wouldn't do this crap. He has done this crap again. We will see what happens..
Told ya we were gonna live under the happiness sun and be one big happy family again!